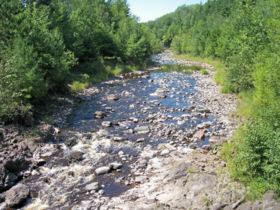 The Bad River is a river flowing to Lake Superior in northern Wisconsin in the United States. It flows for 76 miles (122 km) in Ashland County, draining an area of 1,061 square miles (2,748 km²) in portions of Ashland, Bayfield and Iron Counties. The Bad River issues from the southwestern end of Caroline Lake, a 129 acre shallow lake on the boundary of Ashland and Iron Counties which drains an area of acidic peatlands to its east. The Bad River initially flows southwestwardly before turning generally to the north for most of its course, along which it passes through the city of Mellen, Copper Falls State Park, and the community of Odanah in the Bad River Indian Reservation. In the vicinity of Mellen, the riverbed is commonly bedrock and boulder-strewn with numerous whitewater rapids; the river passes over waterfalls and through a granite gorge in Copper Falls State Park. In its lower course in the Bad River Reservation the river's delta along Lake Superior contributes to a 16,000 acre complex of wetlands known as sloughs. The Bad River's largest tributary is the White River, which it collects near its mouth. 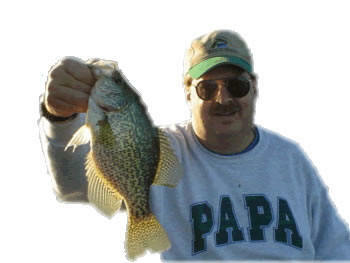 Other principal tributaries include the Potato and Marengo Rivers in its lower course; the Tyler Forks at Copper Falls State Park; and the Iron River upstream of Mellen.